The start of this weekend’s swimming competition at the Olympic Games marks, for some, the culmination of a journey that started 9 years ago, ironically in the city where the Olympics could so easily have been held. Because four of the team that will represent Britain over the coming week made their international bow at the 2003 European Youth Olympics in Paris and were part of what at the time was one of the most successful performances by a British team at that level, one that secured 17 medals in total: 4 gold, 5 silver and 8 bronze. The European Youth Olympics in a multi sport event aimed at 13/14 years old girls and 15/16 years old boys and give them the opportunity to compete in an event with athletes from other sports and in some ways represents what they would experience at an Olympics. For Michael Rock, Rebecca Adlington, Stacey Tadd and Francesca Halsall, Paris 2003 marked the start of their Olympic journey. That journey took Rock, Halsall and Adlington via Beijing, with obvious outcomes, but the reality was that 2012 was always the aim for the girls that competed that year. Buin in 2003 they succeded in style with Adlington claiming silver over 400m and 800m freestyle, Halsall claiming bronze in the 50m and 100m freestyle (and also a B final place in the 200m backstroke) and Rock leaving France with a 200m butterlfy gold in his bag. The most successful for the quartet though, was Tadd who won gold in both the 100m and 200m breaststroke. All four also picked up relay medals. From Paris their paths diverged; Rock went on to the offshore training camp in Australia, while Halsall joined the “Smart Track” programme of Bill Sweetenham’s design, taking her around the world for training and competition. 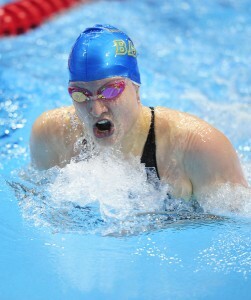 Adlington an Tadd stayed with heir home programmes, at Nova Centurion and Bath university respectively. So while their geographic paths diverged, their Olympic journeys have now come together once again. No-one was in any doubt how talented the group of swimmers that went to Paris were, but swimming like many elite sports is a war of attrition and not everyone can make the grade. For four of that team to have made it to 2012 says much for their determination and the support they have been given. I was the press officer for the event and I can honestly say in hindsight that trying to extract meaningful quotes from Adlington was not the easiest task, while Halsall was as talkative as she remains to this day, but the obvious excitement and joy emanating from all the swimmers at their results was infectious. While I can’t claim to have contributed in any way to their success, looking back I feel extremely lucky to have been part of their first steps towards the Olympics. I feel sure all four, along with the rest of their team-mates will do Britain proud over the coming 8 days of competition.